Our Category 5e In-line coupler is ideal to link an exit network cable run or to simply extend your patch cables. They are capable of handling LAN speeds of up to 1000Mbs. 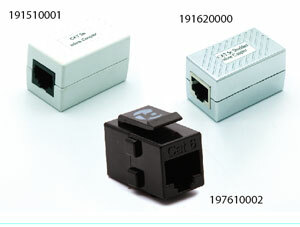 The coupler meets TIA/EIA 568A and ISO/IEC DIS 11801 Category 5e specification, and is Cat 5e & Power Sum certified. They are available either shielded or unshielded to meet your requirements.